Few would doubt that Outsourcing has emerged as a key topic for both IS practitioners and academics. But when did academics notice the importance of this topic? It was in the early days of IS outsourcing research when Arje Wassenaar, Markku Saaksjarvi and Rudy Hirschheim were inspired to put together the first academic Conference on Outsourcing of Information Systems Services (OUT'93) which took place in 1993 at the University of Twente in the Netherlands. Since then, research on IS outsourcing has evolved rapidly. By 2001, over 100 academic papers, along with numerous doctoral dissertations had been published on IS outsourcing. This motivated us (Rudy Hirschheim, Armin Heinzl, and Jens Dibbern) to conduct the 2nd International Conference on Outsourcing of Information Services (ICOIS'2001) which was carried out at the University of Bayreuth in Germany. 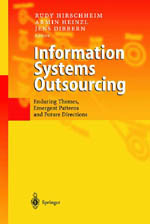 Based on the papers presented at the conference in Bayreuth, a book entitled Information Systems Outsourcing in the New Economy: Enduring Themes, Emergent Patterns and Future Directions was published in 2002. Since then, IS outsourcing continued to be a topic of great contemporary importance. New sourcing trends such as offshoring, business process outsourcing (BPO) and backsourcing have emerged and are of great interest to academics and practitioners alike. To recognize these new trends, we put together a 2nd edition of the book in 2006 appearing under the title “Information Systems Outsourcing: Enduring Themes, new Perspectives, and Global Challenges. We also felt the time was ripe to continue the conference tradition by running the 3rd International Conference on Outsourcing of Information Services (ICOIS'2007). This conference was again jointly organized by the three of us assisted by Jessica Winkler. We had a wonderful conference location at the Villa Bosch in Heidelberg. (You are welcome to learn more about the events from the web sites of ICOIS'2001 and '2007 at www.icois.de). As a result of this conference, the 3rd edition of the book was published in 2009 under the title "Information Systems Outsourcing: Enduring Themes, Global Challenges, and Process Opportunities". After a pause of another six years, in which the IS outsourcing research stream has continued to flourish, we decided it is time to run the next ICOIS in 2013. The objective of the forthcoming conference is to bring researchers in the field of IS outsourcing together again, to exchange ideas and discuss current and past research projects. The conference is planned to be held at the Mannheim Palace, Germany, June 10-11, 2013 (see www.icois.de). We hope the timing of the event is suitable since it is scheduled right after ECIS'2013 which will take place in Utrecht (NL) from June 5-8, 2013. Mannheim lies in between Heidelberg (our last location) and Frankfurt. It provides plenty of opportunities to visit major scenic places in Germany (e.g. the famous wine street), Austria, Switzerland, or Alsace, France. It is again our intention to invite you and other key academic researchers who have published their IS outsourcing research in the main academic outlets to participate at ICOIS'2013. In order to provide a high degree of interaction and discussion among the conference participants, the meeting will be conducted in a workshop-like setting. As a registrant, you would be expected to attend the entire conference and actively engage in discussions. Each participant will be asked to speak for about 10 minutes and provide a paper based on her/his past, present or future research work on IS outsourcing. The papers will be considered for the 4th edition of the book published by Springer. To this end, we will provide feedback on the individual papers after the conference. This feedback could be used to revise and strengthen the papers before they are published.